Sir Howard Davies, Chairman of the Royal Bank of Scotland, sets out his thoughts on the financing of British Companies at UWE Bristol’s Exhibition and Conference Centre, on Wednesday 9 March 2016. RBS remains the largest provider of finance for British companies, though it is smaller than it was before the crisis and bailout. But how is the financing landscape for British companies changing? New ‘challenger banks’ have come on the scene, together with a range of new types of provider – peer to peer tenders, crowd funding etc. The University welcomes Sir Howard to the Bristol Distinguished Address Series,to discuss how firms should try to navigate through this more complex marketplace. Sir Howard Davies was appointed Chairman of the Royal Bank of Scotland on 1 September 2015. Previous to this, Howard was Chairman of the Phoenix Group between October 2012 and August 2015. He recently chaired the UK Airports Commission and was the Director of the London School of Economics and Political Science from 2003 until May 2011. Prior to this appointment Howard chaired the UK Financial Services Authority from 1997 to 2003. Previously, Howard was Deputy Governor of the Bank of England, after three years as the Director General of the Confederation of British Industry. Earlier in his career he worked in the Foreign and Commonwealth Office, the Treasury, McKinsey and Co, and as Controller of the Audit Commission. Howard is a Professor of Practice at the French School of Political Science in Paris (Sciences Po). Howard also chairs the Risk Committee at Prudential PLC, whose board he joined in 2010. He is a member of the Regulatory and Compliance Advisory Board of Millennium Management LLC, a New York-based hedge fund. He has been a member of the International Advisory Council of the China Banking Regulatory Commission since 2003 and in 2012, was appointed Chairman of the International Advisory Council of the China Securities Regulatory Commission. Previously Howard was an independent Director of Morgan Stanley Inc.
Howard has published five books focused on the financial markets and regularly writes for The Financial Times, Times Higher Education, Project Syndicate and Management Today. 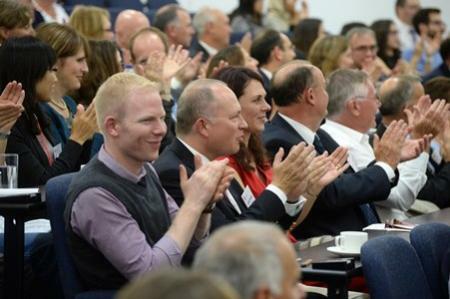 The Bristol Distinguished Address Series is delivered by the Bristol Business School in partnership with ACCA,Bristol City Council, Bristol Junior Chamber, Bristol Post, Business West, CBI, CMI, FSB, IoD,ICAEW and the West of England LEP.